SAS: The description above is not a correct definition of "heavy". For a group to be heavy, it must be weak and not easily sacrificed. Perhaps someone could attempt a correct definition. Dieter: I suggest: weak and not easily sacrificed. John F: Yes, that's a nice insight, Bill. Regarding the comments above. I disagree completely that thickness can be heavy. A thick group is by definition safe. A heavy group is by definition a burden. I suspect the writer is mixing up thickness and influence. It might be a useful corrective to take Bill's advice to extremes and forget shape altogether. deft: If you played a stone which was not kikashi, it represents some investment - if you want to give it up you need to make back that investment somehow, but the problem with a heavy group is that you've made a huge investment in something which turned into a weak group of stones. Now you cannot sacrifice it, because you won't be able to make back the investment that the group represents. Charles Matthews Heavy play usually counts as a mistake. Perhaps the most convincing general reason to play heavily is to save cutting stones, as part of a divide and conquer strategy; in that case the point is that your heaviness is balanced by compensation in the form of your opponent's weak group(s). victim: I think the main difference between heavy and light is: in a heavy group the stones are solidly connected, while a light group consists of stones that can still be cut. That way you can throw away parts of a light group, but a heavy group can only live or die as a whole. The words heavy and light apply only to groups in the opponent's sphere of influence. You should connect solidly in your own sphere of influence, since you don't want to lose any of them, but in the opponent's sphere of influence, scatter your stones - since you don't need to save all of them in order to succeed. Charles Matthews: It's an interesting comment, and I can see that it is reasonable debating position. It does however then make me think that sphere of influence doesn't mean quite the same as framework: it should be a broader term. For example, here is a mistake. After to attack, you can say that Black has a heavy group. Even if I make a marvellous wall constituting one border of my moyo, after some invasions and fights that wall may end up a heavy group. I wouldn't call it heavy as long as it's a moyo border. But I see what you mean. In the case above, heaviness is just one move away even if I use the equivocation in my previous two paragraphs, so everyone would call heavy before is there. The words heavy and light apply only to isolated groups or groups in danger of being isolated. Charles I think that's probably true. It might be helpful: for example if there is a ko fight happening, the 'danger' can be in unexpected places; and it may be a sensitive comment on the game that one should play more lightly (because some large-scale exchanges can occur). 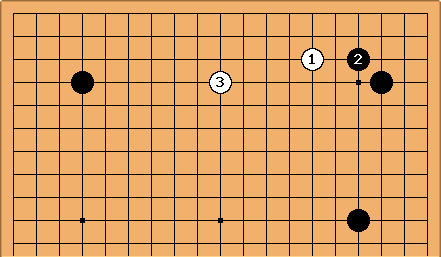 In this kind of case, which is typical of contemporary go, both and are attempts to play lightly. I feel there may be some aspect of 'contiguity', to add to framework theory, which expresses more clearly this as a concept. It obviously is an advantage to me, if my opponent makes a heavy play on the outer edge of my framework. Bob McGuigan: This is on a different tack from the discussion above, and it might be more appropriately placed somewhere else. Anyhow, I have often noticed weaker players being confused about the distinction between heavy and thick. I have watched a double-digit kyu game in which a player made a big, heavy group which, in the post-game discussion, was called thick. Tom: I'm a little suprised that there is confusion about the term 'heavy'. After I had had to carry a heavy group through a game, I found it to be one of the most apt go terms. AJP: Agree. "heavy" to me is short for "burdensome", and is defined by my attitude alone. If dealing with particular stones of mine is cramping my style for what I want to do with a game, then those stones are heavy, regardless of shape, safety, value etc. It is the term "light" that I find less obvious, except as a not-quite-appropriate opposite for "heavy".